Although the school year has already begun, it’s never too late (or early) to think about what your child’s school needs to know regarding his or her special CHD situation. And any time is a good time to consider what information you should provide to your child’s school so they can better care for and support your child. For starters, it’s always a good first step to schedule a face-to-face meeting with important school faculty members (nurse, principal, counselor, classroom teacher, etc.). This will help all individuals be able to put a face with a name and to get to know your personalities, expectations, and concerns in a personal yet professional setting. Printing off some general information/facts about your child’s specific CHD to take to this meeting is always advised. Copies should be given to at least the nurse and classroom teacher. If your child’s condition is severe enough that it will require a special needs counselor, then of course the counselor will benefit from the information sheet as well. During your discussion you should inform all pertinent faculty members of several issues. One issue being your child’s possible learning/developmental problems. Since some children with CHDs can develop learning delays or problems, let the teacher know you’d like to be made aware of any signs of concerns the teacher may have during the school year. That way you can address the concern with your child’s doctor and get his or her recommendations. Another issue to discuss deals with your child’s general health; since children with CHDs can be at a higher risk of contracting certain infections, ask the teacher to notify you if other children are sick. Also regarding general health, the teacher (especially the physical education teacher) should be made aware that your child may require more rest or may be prone to tiring more easily. There’s also the important issue of the medical care that your child may need throughout the day (medications, procedures, etc. ); in these cases, the nurse and teacher should obviously be well informed about the specifics – your child’s doctor would undoubtedly supply you with information/handouts explaining your child’s medical needs that could be given to the nurse. An important (if not the most important) issue that most parents want to impress upon their child’s school is that their child is a regular kid…they should be treated as such. It’s important to let your child’s school know your desire to have your child feel “normal” and included like every other child. Overall, it’s important to remember that while some children’s CHDs are relatively simple and may not require any special care at school, other children may need regular intervention and attention from school faculty members. So, it’s imperative that parents evaluate (especially with their child’s doctor) what exactly the school needs to know. It’s one of the most (if not THE most) important decisions you will make for your child once he or she is diagnosed with a CHD…choosing a pediatric cardiologist. When a diagnosis is made, parents go through so many emotional challenges that this overwhelming task can seem daunting or even impossible. But giving serious thought to who will give your child medical care is so important, and so many parents struggle with exactly what to look for when making their pediatric cardiologist selection for their child. After researching the medical community opinions and receiving parental input, we’ve compiled a list of some of the most important factors to consider when making that choice. 1. Referrals: At first, many parents are referred to a pediatric cardiologist by their child’s pediatrician (or a hospital pediatrician if the CHD is discovered at birth). But don’t feel you have to use the particular doctor who is referred to you. It’s your prerogative and right to be able to search and find the cardiologist that suits your family’s needs. 2. Insurance coverage: Although we hate to have to factor this into our decision-making process, unfortunately for many families, treating CHDs can be a long and costly journey, so knowing that your insurance will be accepted by the doctor/hospital you choose is definitely something to consider. 3. Location: In some cases, families claim they are willing to travel anywhere to seek medical treatment for their child. However, if it’s simply not a possibility for you (ex: work responsibilities, costly travel expenses, frequency of your child’s doctor visits, etc. ), then definitely consider the proximity of the doctor’s office/hospital to your home. 4. Basic credentials: This is obviously one of the most important factors. What kind of education and training did the doctor receive? Is the doctor board certified in pediatric cardiology? What types of procedures do they have experience with? 5. Experience with specific CHD: For many, it’s simply not enough to know that a potential doctor has treated patients with CHDs. They want to be assured that the potential doctor has treated patients with their child’s specific type of CHD. 6. Doctor – Family Relationship: After having a consultation with this doctor, does he/she seem to be willing to work with your family and not just the patient (in other words, are they interested in educating and keeping you all informed or are they merely interested in treating the CHD)? Also, do you get along with this doctor (this may seem insignificant, but for many parents finding doctors whose personalities are compatible with their own makes their treatment journey that much easier)? Having said that, this may be one area that most parents would sacrifice if the doctor is exceptionally talented in their medical field of practice. Even though this can be quite a stressful time, knowing what to look for when it comes to choosing your child’s medical caregiver can provide some much needed peace of mind. Ultimately, no one knows how to better care for your child than you do. As a parent, you have instincts, passion, and most of all love – all these things mean that you are perfectly capable of giving your child the best care possible. However, when you learn that your child has been diagnosed with a CHD, most parents can’t help but wonder, “How do I care for my child?” We all second-guess our parenting abilities from time to time, but when you have a child with extra needs, we may find ourselves second-guessing our actions even more. Here are some specific things that parents of children with a CHD should consider when providing care for their children. Although many of the day-to-day tasks such as special feedings, looking out for signs of problems or complications, or administering medicines actually become like second nature and relatively “easy” over time, other issues within the realm of caring for our children are what cause us to doubt ourselves. One of these issues involves how to treat our children when it comes to addressing their illness. Whether your child is diagnosed with a CHD in infancy or later in childhood, you’ll have to explain to him or her things such as why they have a surgical scar, why they need to visit the doctor/hospital more frequently than some other children, why they must take medication every day, etc. Many parents think they can’t handle or shouldn’t address these issues; however, it is by addressing these issues and having these types of discussions with your child that makes your care for them even that much better. Besides communicating with and educating your child, the main advice that numerous child psychologists and doctors will give regarding this issue is to encourage your child to become involved in their own care (when/if they are emotionally and physically able of course). This makes children feel much more confident and in control – children will most likely think, “Wow, if Mommy and Daddy trust me to take care of myself I must be doing great!” It’s a great tool to empower your child and yourself. Depending on the level of care your child requires, the doctor or other members of the medical team can give you specific instructions regarding how to incorporate your child in the caretaking process. And at the end of the day, involving your child in their own caregiving is the best way you as their parent can care for them as well. It’s one of those challenges that all families affected by a Congenital Heart Defects (CHD) face…how to keep the balance amongst siblings. There are so many issues that come into play when considering how to treat your children who are not afflicted with a CHD. There’s a fine line – you don’t want to burden them with too many responsibilities or make them feel less important, yet you also don’t want to spoil them to overcompensate for the fact that so much attention is paid to their ill sibling. How do you handle it? Where do you turn for advice? We’ve compiled some tips and advice that was gathered from other parents, online resources, as well as publications by child psychologists. · While it is very important that all siblings be informed about your family’s specific CHD situation, it’s important to set an example that it’s not something we have to dwell on every day. All children want to live as normal a life as possible. So, by educating your children about CHD rather than making it a daily focus, you’ll be off to a great start in establishing a balance amongst your children and your entire family as well. · Allow your children who do not have a CHD to choose a specific responsibility in order to empower them. This will let them know that you value their help yet you won’t be burdening them with too many expectations. For example, maybe a sibling can simply be a reading buddy for your child with a CHD. · Remember to let all your children know how much you appreciate their help. If they happen to be too young to actually be of any significant help at the moment, you can always tell them how much you appreciate their understanding and patience when you have to assist or focus on their sibling who is sick. · Although it can be tempting for many parents, avoid spoiling your other children in an effort to make up for the attention you feel you’re giving your child with a CHD. Spoiling them can include giving an abundance of material items, too much attention, or even treating them with kid gloves as though they’re too fragile to handle your family’s situation. They will grow up with a sense of entitlement or even resentment. Kids are smart – they will eventually realize why you’re spoiling them and will in many cases feel like they didn’t truly earn the things you gave them or the over-attentiveness you showed them. · Encourage your children to express their feelings. Talking can be such a powerful tool when it comes to children. It doesn’t matter their age – you can always adjust your conversations by using developmentally appropriate language to answer their questions or respond to their statements. Be truthful yet simple and to the point with your children. One story we came across involved an older sibling who asked why his little brother was sick; he thought he did something wrong. In this situation, it was suggested that the parents have a real conversation with explanations that were simple and truthful. For example, you might say “You didn’t do anything wrong; your brother just has a special heart. We’re all special in our own ways.” Sometimes, it may seem impossible to discuss CHD related topics with your children; however, it’s much wiser to at least let them know you heard them and are willing to try a discussion rather than simply changing the subject. At the end of each day, this whole issue does tend to feel like quite the balancing act. However, it is so important to make a conscious effort to remember to think about how you’re treating all your children. Do they feel equally important? Is one child feeling neglected or perhaps, on the other hand, that you’re actually being over-attentive to him/her? These are questions we can stop and ask ourselves each day to try to keep that balance and ensure that our children sense that balance amongst their sibling relationships. It's almost CHD Awareness Month! What are you doing to spread the word about CHD, its warning signs, its long term effects and the little known facts about its frequency? We'd love to hear! Traci Lisa's daughter, Cassidy, was born with Tetralogy of Fallot w/ Pulmonary Atresia. 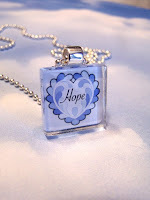 This heart mom is spreading the word about CHD through her talent... making awareness jewelry. Check it out! Share your efforts with us and spread the word. February is National CHD month. What can you do to save a life?! Check out ABC News' Hostages Dying for Healthcare Reform article... it sounds just like my family, does it sound like yours? Many of us are captive to our big company insurance plans - no other companies will take us, and if we lapse in our policies, we're out of luck due to pre-existing conditions. Heart conditions account for $123 billion in health expenses a year. We may not agree within our community of heart warriors what the best solution is for health care reform, but we have all, likely, lived first-hand the need for change. Take a moment to write your congressional representative and share your story with them.